Employers run criminal background checks to provide a safe workplace for their staff and customers and meet certain compliance requirements in their industry. Job seekers, especially those with any run-ins with the law, are curious what employers will see on criminal background checks. The answer is, "It depends". With many types of background searches, and different laws in certain jurisdictions, information on criminal background checks could vary. The employer would need to know the information required to meet the hiring requirements of their organization, the restrictions of their jurisdiction, and how best to obtain that information. In general, here's what information shows up on criminal background checks. Database searches - A database search includes a compilation of data from many other databases. For instance, the National Crime Information Center (NCIC) and the National Instant Criminal Background Check System (NICS), both operated by the federal government, combine information from various participating jurisdictions and sources to offer a broad look at an individual's criminal background, including sexual offenses. Neither of these databases are available to the general public. Federal criminal searches - Federal criminal searches access data from federal district and appellate courthouses throughout the United States. This search would reveal fraud, kidnapping, robbery, tax evasion, and more. Statewide (all county) searches - All county searches include statewide criminal activity in the individual's residential state. Some of these offenses may be felonies, misdemeanors, or traffic violations. Local county searches - Local county courthouse searches will reveal arrest records, probation, warrants, incarceration time, as well as dismissals. International Watch List - If the Department of State has identified the individual as a threat to the country, they will be found on the International Watch List. Which Criminal Background Checks are Most Reliable? Database and other searches are only as accurate as the information reported to them. Some courthouses or counties don't report with regularity to national databases due to different requirements. For the most accurate and up-to-date criminal records, a best practice is to focus on federal, state and local county courthouses for the most up-to-date information. How Far Back Do Background Checks Look? Another determining factor to what shows up on a criminal background check is the jurisdiction. Criminal convictions at the federal level can be reported at any time, unless there are state limits. New York, for example, limits criminal convictions being shown after 7 years for employees making less than $25,000 per year. Texas also limits criminal convictions after 7 years of release, parole, or disposition for those individuals who make less than $75,000 a year. Teenagers who are convicted of crimes may have their records sealed or expunged, depending on the state. To learn more, read how criminal background checks affect teen felons. How Should Employers Consider Criminal Background Checks? If an applicant's criminal background check shows a conviction, should an employer withdraw the offer of employment? Not exactly. The employer must, under the individual's FCRA rights, allow them the time and opportunity to dispute or explain any unfavorable results on a background check. 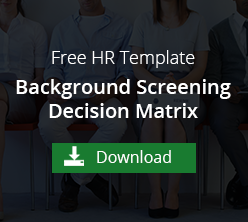 If the results are true, the employer must also assess their own background screening policy and decision matrix to determine if the criminal record can be used to deny employment. A criminal background screening policy is a guide for hiring managers to consider if the criminal offenses, and how much time as passed since, would affect the job functions. To learn more about creating this policy, review this ebook on job-related background checks. A decision matrix guides the hiring manager on which criminal convictions are immediate disqualifications for applicants of particular jobs. This policy can be created with this decision matrix template. Employers must also be aware of their state's or city's Ban the Box regulations as well as EEOC guidance to prevent discrimination when hiring. Understanding these limitations to criminal background checks may be overwhelming for employers who don't hire regularly or who are hiring at high volumes. A professional background screening company can be helpful in the screening process to save both time and money while helping to protect your business from unwanted criminal activity.